Politics and ideology now exist in a confused and changing world where traditional political doctrines are being reformulated and challenged by new ones. Politicians still call themselves socialists, conservatives and liberals, but amongst these groups exist very different understandings of what these terms represent. This volume examines the variety of ideas, values and doctrines that influence British politics today, in the light of how they developed and arrived in their present state. 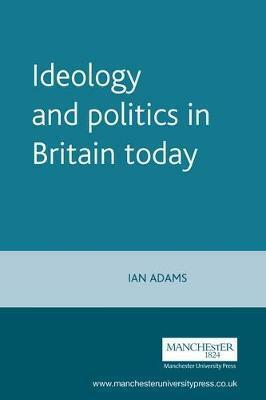 The first section of the book looks at different aspects of the wider context: the nature of political doctrines or ideologies, and the role they play in politics in general; the British constitution and how one ideology - liberalism - has been especially important in shaping it; and the role of economic theory in modern politics. The main section of the book examines individual ideologies, broadly grouped into two catagories of "mainstream" (conservatism, socialism, liberalism and nationalism) and the "fringe" (greens, the far left and the far right). Finally a short section considers the future and what forces may shape the further development of those doctrines which are part of British politics today. Part I Background: politics and ideology - what is politics?, the nature of ideology?, ideologies and political parties; British liberal democracy - liberalism and modern history, achieving a liberal democratic constitution, liberalism and modern politics; economics and consensus - the age of "laissez faire", the post-war consensus, the decline of consensus, a new consensus?. Part II Mainstream: Whigs and Liberals, Levellers and Whigs, revolutionaries and radicals, free market or "laissez faire" liberalism, liberalism and progress; new Liberals and Liberal Democrats - new liberalism, triumph and decline, the continued development of New Liberal thinking, the Alliance and the Liberal Democrats, Liberal Democrat thought and prospects; traditional Conservatism - Tories, Whigs and Edmund Burke, Tories to Conservatives, late Victorian Conservatism, return to moderate conservatism, traditional conservatism versus Thatcherism; Thatcherite Conservatism - neo-liberalism, against socialism, government's role in the economy, neo-liberalism and the new right, Thatcherism in practice, the Conservatives after Mrs Thatcher; British socialism and the Labour movement - classical and liberal ethical socialists and British socialism, the rise of the Labour party; social democracy to New Labour - classical to liberal socialism, the resurgence of classical socialism, Labour under Kinnock, the Blair revolution; nationalism and the politics of Europe, the concept of nationalism, nationalism in Scotland and Wales, Irish nationalism, British nationalism and Europe. Part III The fringe: Green politics - threats to the environment, Green doctrine, industrialism and its alternatives, shades of Green, criticisms of Green ideas; the extremes and the fringe - the extreme left, fascism in Britain, the non-extreme political fringe. Part IV The future: the future of ideology? - the fading of the nation state, late modern or postmodern?